Dividends are a great way to supplement capital gains, especially for large pharmaceutical companies that have more cash than they know what to do with. But dividends aren't enough in and of themselves to produce substantial gains. We asked our team of healthcare experts for examples of pharmaceutical companies that might not be worth spots in your portfolio despite their dividends. Read on to see why Brian, Sean, and Cheryl think you should be cautious about adding Eli Lilly (NYSE:LLY), AstraZeneca(NYSE:AZN), and GlaxoSmithKline (NYSE:GSK) to your portfolio. Brian Orelli: Eli Lilly's 2.5% dividend yield looks tempting, and I guess that would be an OK return if it were an investment in a savings account that was FDIC insured. But stocks can -- and do -- go down, so you have to find companies that have an expected return that justifies the risk. Over the last five years, Eli Lilly has certainly done that. Shares have increased about 140%, making it a pretty good investment, especially after adding in the dividends. But a closer look at the drugmaker's numbers and you'll see that Eli Lilly's revenue has actually dropped 14% since then. Earnings per share look worse. Crazy, no? The only logical explanation is that Eli Lilly was undervalued five years ago, and the drop in revenue and earnings wasn't as bad as investors feared, causing shares to increase. 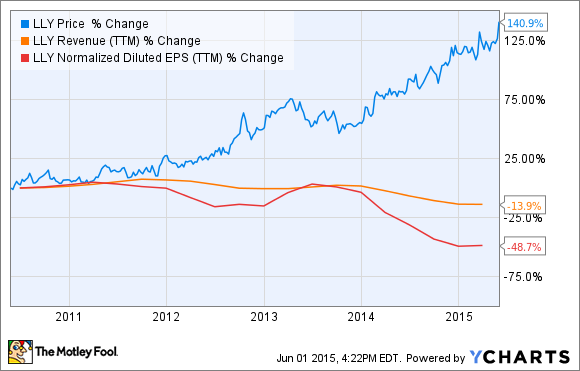 To figure out whether or not Eli Lilly is overvalued, we have to look at the future. This year, the pharma is guiding for adjusted earnings per share between $3.10 and $3.20, which is higher than the $2.78 it posted last year but nowhere near the $4.15 Eli Lilly managed to get in 2013. In the first quarter, Eli Lilly only had one major drug growing at double digits: Strattera, an ADHD medication, grew 13% year-over-year, but most of that increase was due to higher prices, not because there was more demand for the drug. Eli Lilly's pipeline certainly isn't stagnant -- it gained FDA approval for cancer drug Cyramza this year -- but most of that pipeline is hard to get excited about. The drug with the biggest potential, solanezumab for Alzheimer's disease, is also one of the drugs that is most likely to fail, given the history of drugs to treat Alzheimer's disease. If solanezumab succeeds -- we should know toward the end of 2016 or early 2017 -- investors will see solid two-year returns from here, but considering the company is trading at a decade-long high, it's hard to see the potential reward justifying the risk. Sean Williams: The pharmaceutical industry -- especially Big Pharma -- is popular among income investors and long-term retirement portfolios because of its incredible cash flow and healthy dividend yields. However, not all Big Pharma stocks are created equally. In fact, I'd suggest that U.K.-based AstraZeneca could wind up being toxic for investors' portfolios. On one hand, AstraZeneca has an incredible allure for investors for two particular reasons. First, it pays out a 5.6% dividend yield, which is about double the average yield of the S&P 500. Additionally, AstraZeneca caught the attention of Pfizer (NYSE:PFE) last year, implying that AstraZeneca could still be a takeover or merger target for another Big Pharma company. But there's a lot to be concerned about as well. High on that list is the devastating effect that patent losses are wreaking on AstraZeneca's top- and bottom-line. After losing bipolar disorder drug Seroquel to generic competition in 2012 -- Seroquel represented about an eighth of AstraZeneca's total revenue -- and blockbuster Nexium last year, AstraZeneca is now facing the upcoming loss of cholesterol drug Crestor in 2016. All told, even with the purchase of Bristol-Myers Squibb's (NYSE:BMY) portion of its diabetes alliance revenue, AstraZeneca is facing a revenue decline over the coming four years. Its EPS estimates aren't encouraging either, with a contraction expected between 2014 and 2018. On a valuation basis AstraZeneca is valued at between 17 and 18 times forward earnings, it's carrying more than $4 billion in net debt, and it has a negative PEG ratio based on the fact that its revenue and EPS figures are expected to contract through 2018. This isn't a value investment, but is instead a potentially toxic Big Pharma stock, and I'd suggest income investors keep moving along. Cheryl Swanson: British drug-maker GlaxoSmithKline now sports a massive yield of 5.2%, which, in this yield-parched world, could appear tempting. But Glaxo is a real return-killer, having largely missed the equity rally of the past six years. In fact, the stock price has dropped 16% in the past 12 months, truly terrible compared to the almost 18% gain of the overall pharmaceutical sector. While Glaxo's Chinese bribery scandal is becoming old news, as 2015 progresses, the company keeps running into new foul ups. On April 16 Glaxo announced a recall of all remaining doses (1.7 million) of its four-in-one flu vaccine because of effectiveness problems. On April 24, potency issues were also reported with the company's malaria vaccine. The recent vaccine snafus make the company's decision to send its high-margin oncology assets to Novartis (NYSE:NVS) -- in exchange for the Swiss pharma's less-profitable vaccine business -- even more questionable. The $20 billion-plus asset swap was supposed to refocus Glaxo in its core area of expertise, as well as take up slack from its respiratory med business, and vaccines are expected to churn out 14% of company sales going forward. But this past season's flu vaccines posted one of the worst efficacy rates in recent memory, so it's likely considerably fewer people will be lining up for jabs next year. Meanwhile, what about the dividend? Could it be cut? Glaxo paid out about 85% of its profit in dividends last year, the highest ratio among all Big Pharmas. While management has been scrambling to reassure investors the dividend is secure, with key drug Advair sales floundering and wannabee-blockbusters Anoro and Breo falling short of estimates, a dividend cut is not off the table for this stock, no matter what management says. Dividend dogs have their appeal, but this seems destined to remain a real howler. I'd stand well clear.